Visible arcs in the nightside oval can appear as multiple ``curtains'' (two, or more nearly parallel arcs; see, for example, early studies of Stormer, 1955) separated by distances ranging from several hundred kilometers to about one kilometer or even less (Davis, 1978, Timofeev and Galperin, 1991; Borovsky, 1993). The multiplicity of arcs appears to be a rather typical phenomenon (often seen from the DMSP satellite images) for locally steady conditions within the auroral oval. Its importance for understanding of magnetospheric processes and mapping has been recognized for a long time (see Akasofu et al., 1967). Field-aligned (FA) currents in multiple auroral arcs at the nightside have been measured several times in rocket auroral magnetic field experiments. In the 90s some prominent cases of multiple current sheets within the auroral oval were reported by Obara et al., (1993) from AKEBONO satellite, Luhr et al., (1994) from FREJA satellite. The excelent time and measurement resolution of the Romanian magnetometers on board the MAGION-2 (ACTIVE mission) and MAGION-3 (APEX mission) satellites give us the opportunity to investigate the structure of multiple current sheets crossed by the two satellites. 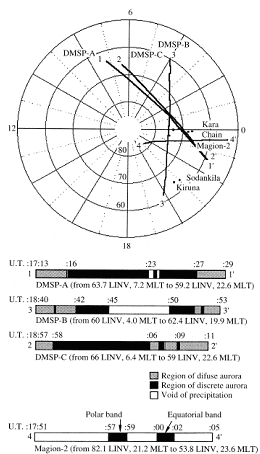 Our results (Echim et al., 1997), obtained during a quieting period after a preceding substorm, or during an early growth phase of the next substorm, show two double-sheet current bands, POLB and EQUB, located at respectively the polar and equatorial borders of the auroral oval separated by about 500 km in latitude. This is consistent with the double-oval structure during recovery introduced by Elphinstone et al. (1995). Within the POLB, the magnetic field data show simultaneous existence of several narrow parallel bipolar current sheets within the upward current branch (at 69.5�70.3? ?invariant latitude) with an adjacent downward current branch at its polar side at (70.5�71.3?). The EQUB was similarly stratified and located at 61.2�63.5? ?invariant latitude. The narrow current sheets were separated on average by about 35 km and 15 km, respectively, within the POLB and EQUB. A similar case of double-oval current bands with small-scale structuring of their upward current branches during a quieting period is found in the data from the MAGION-3 satellite. These observations contribute to the description of a double-oval structure during the late recovery phase, and add a small-scale structuring of the upward currents producing the auroral arcs in the double-oval pattern. Akasofu, S.-I., S. C. Chapman, and P. C. Kendall, The significance of the multiple structure of the auroral arc, in: Aurora and Airglow, Ed. B.M., McCormac, Reinhold Publ. Corp., New York, Amsterdam, London, 281�286, 1967. Borovsky, J. E., Auroral arc thicknesses as predicted by various theories, J. Geophys. Res., 98, 6101�6138, 1993. 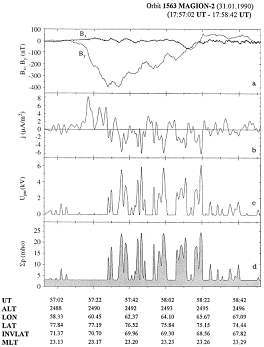 Davis, T. N., Observed characteristics of auroral forms, Space Sci.Rev., 22, 77�113, 1978. Elphinstone, R. D., J. S. Murphree, D. Hearn, L. L. Cogger, I. Sandahl, P. T. Newell, D. M. Klumpar, S. Ohtani, J. A. Sauvaud, T. A. Potemra, K. Mursula, A. Wright, and M. Shapshak, The double oval UV auroral distribution. 1. Implications for the mapping of auroral arcs, J. Geophys. Res., 100, 1995. Luhr, H., J. Warnecke, L. J. Zanetti, P. -A. Lindkvist, and T. J.
Hughes, Fine structure of field-aligned current sheets deduced from spacecraft and ground-based observations initial FREJA results, Geophys. Res. Lett., 21, 1883�1886, 1994. Obara, T., T. Mukai, H. Hayakawa, A. Nishida, K. Tsuruda, S., Machida and H. Fukunishi, Akebono (EXOS-D) observations of 422 M. Echim et al. : Multiple current sheets in a double auroral oval small-scale electromagnetic signatures relating to polar cap precipitation, J. Geophys. Res., 98, 11153�11159, 1993. Timofeev, E. E. and Y. I. Galperin, Convection and current in stable auroral arcs and inverted-V's, J. Geomag. Geoelectr., 43, Suppl., 259�274, 1991.